I had no idea how much of a dump Stamford, CT was until I visited. I had these visions of nature and colorful foliage, but that’s not what I found in that horrible mini-metropolis. In need of a really good post-wedding hangover meal in the area, we ventured from the Fairfield and Norwalk area over into the heart of Stamford and headed to a place called Colony Grill to see what Connecticut-style pizza was all about. Honestly, this place was in a really awful part of town. The road was in complete disarray – it was more pothole than actual road and it was completely covered in filthy, murky water. Everything around the place was pretty much a desolate, post-apocalyptic wasteland. But somehow Colony Grill manages to endure and has been holding it down in that decrepit location slinging seriously unique thin-crust bar pies since 1935 and the people keep coming back for more. 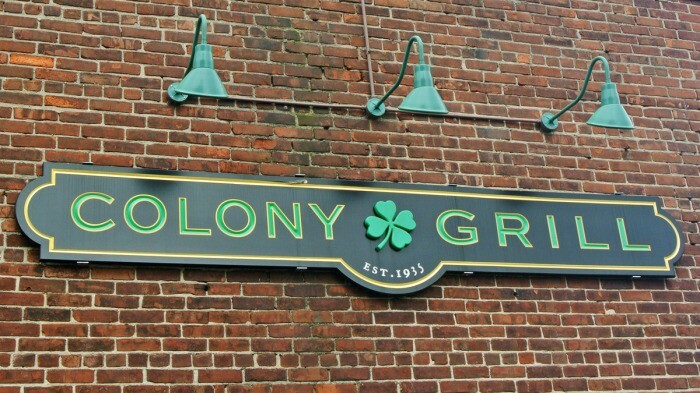 Colony Grill is half old-school sports bar and half retro-chic pub restaurant defined by its dark wood paneled walls, TVs overhead, and deep 6-seaters booths. 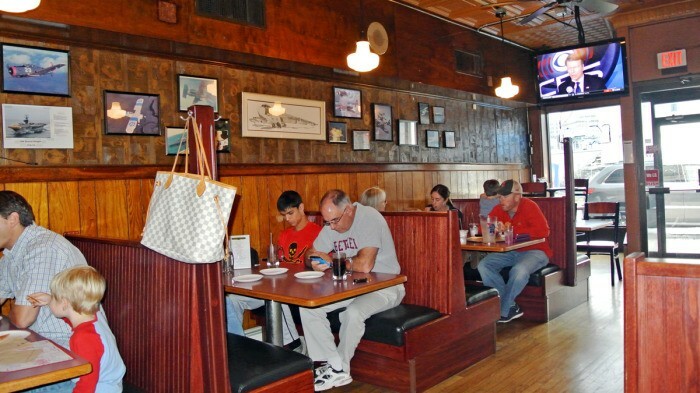 Even though it really is a bar, nearly every table in the place was populated with a family – usually a set of parents dragging along their snotty 4 and 7-year-olds for a pizza-filled meal. I get it, I get it. Kids love pizza. I just didn’t expect that many annoying families of four in a bar setting that early on a Sunday morning while I was deathly hungover. But, like I was saying, the purpose of this pit stop was to sample Connecticut-style pizza. And the stuff they’re serving at Colony Grill in Stamford was truly unusual and worth stopping in for. Even though the format may look quite similar to the upscale Neapolitan pies you frequently see in NYC at places like Motorino and Keste, it really is its own beast. The pizza is about as no-frills as pizza gets, but there was absolutely no doubt in my mind that every one of the offered bar pies was going to be ridiculously delicious despite their lack of showiness. The key to ordering, no matter which toppings you decide on, is to select Hot Oil as one of your choices. Even Adam Kuban, the well-regarded and highly opinionated pizza critic over at Serious Eats, who’s opinion I wholly trust, loves the stuff. Amy and I each ordered our own personal pie. We needed it, badly. I went for the hearty and hefty hangover-killing combo of Sausage, Pepper, and Hot Oil on my pizza. The crust was super thin and sagged a bit under the weight of those moist and meaty toppings, but every messy bite was more delicious than the next. Seriously, this was exactly what I needed in my booze-addled state. And yes, that Hot Oil was wonderfully greasy and sloppy and added a nice kick to the whole thing. Those green things on there? They’re another topping that they call Stingers. I had asked the waiter what they were, but had not asked to have them included on my pizza after I was informed that they were in fact Roasted Serrano Peppers. I don’t have a death wish, dude. Yeah, even I wasn’t crazy enough to swallow those tiny green pain-inducers. All it took was one nibble off the end of one for me to tap out and pick them off of my already plenty-spicy and beyond-delicious pizza. Amy’s topping picks were also really excellent and I think probably worked out better than my own choices. 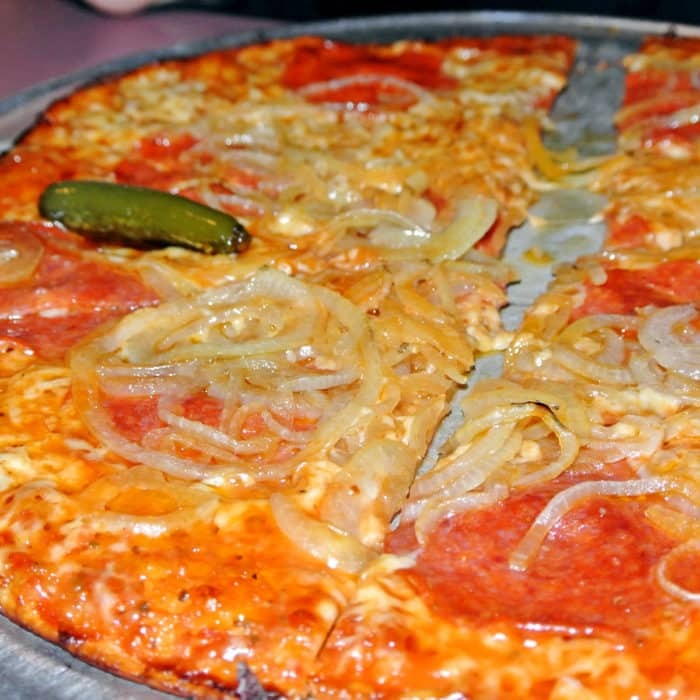 Her selection of Pepperoni, Onion, and Hot Oil was much lighter in weight than mine, though still just as satisfyingly greasy. 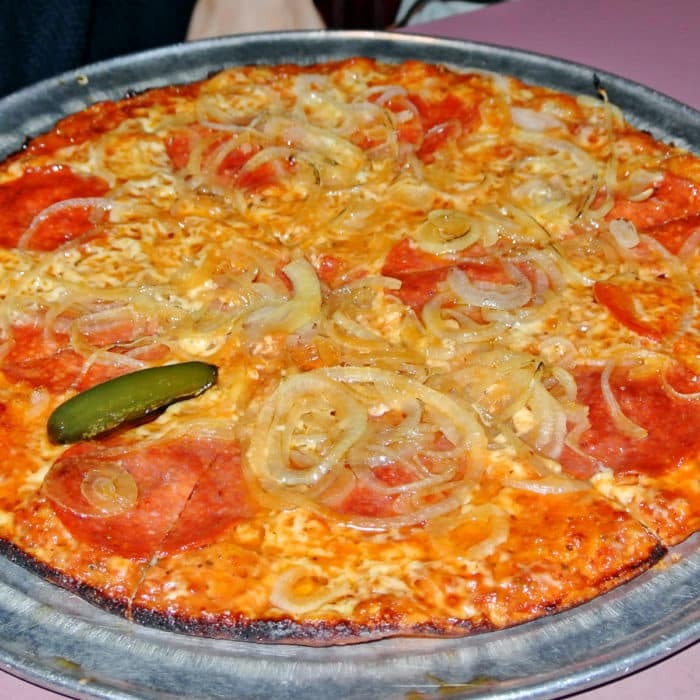 This allowed the cracker crisp crust to retain its integrity and really show off what it is to be Connecticut-style pizza. I think the flavor of this topping combo was equally as wonderful as the ones I had selected, but this version really allowed the pizza’s texture to shine best. 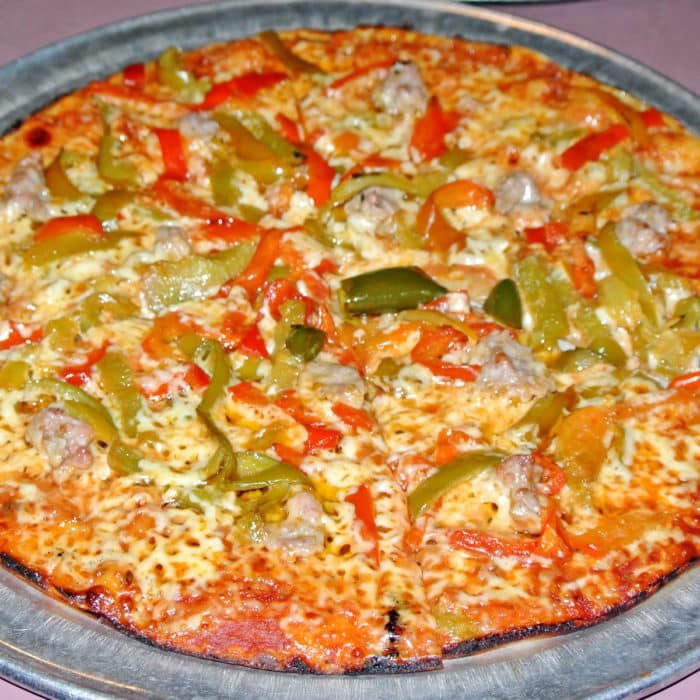 In conclusion, though I may be partial to many of the pizza parlors I frequented in my NYC days, there’s nothing wrong with adding this new bar pie style of Connecticut pizza to my repertoire when I can get my hands on it. It was messy, filling, cheap, and downright delicious. What more could I ask for while hungover and craving pizza? 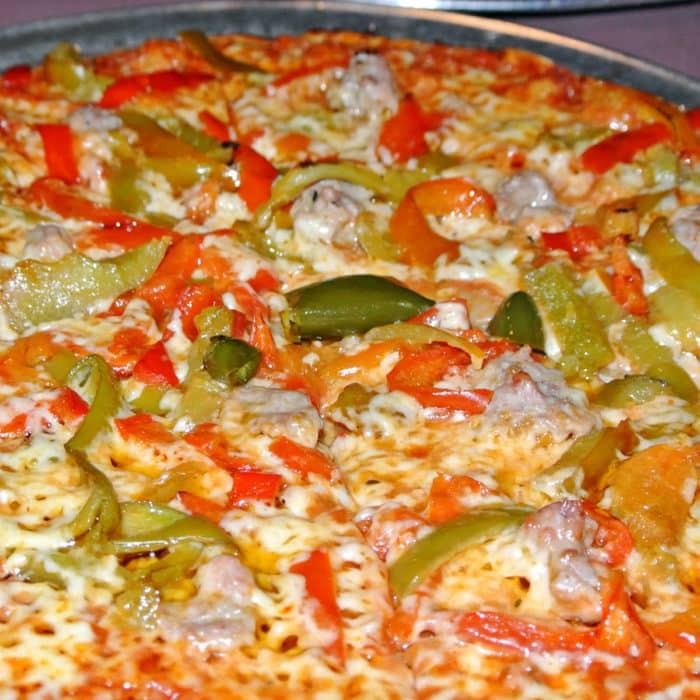 What your favorite style of pizza and where do go for to get it? Let me know in the comments below.